The Worcester Railers have five home games left at the DCU Center this regular season as the PLAYOFF PUSH IS ON! Come cheer on the Railers and catch some of the exciting promotions upcoming! Friday, March 22 – 2-3-4 Friday on 100 FM The Pike Night! Enjoy $2 popcorn, $3 soda, and $4 Bud Lights in the Bud Light Lounge. Chuck a puck at Chuck Perks and raise money for local charities. 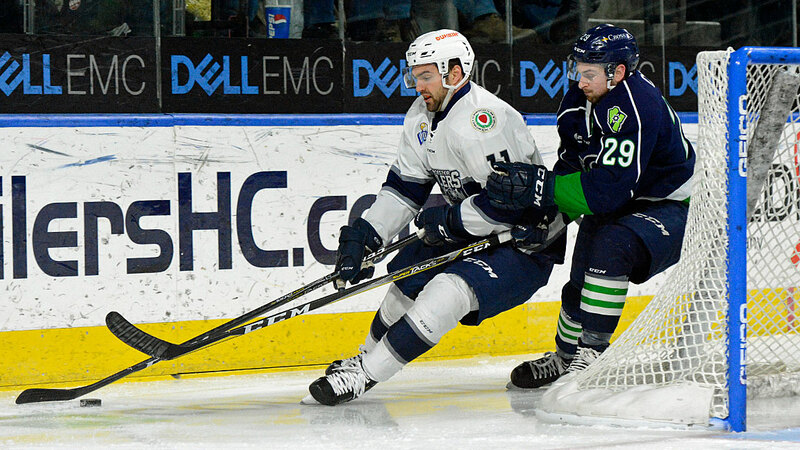 Puck drop at 7pm vs. the Maine Mariners….if the Railers win….they will move back into a playoff spot in the North Division! Saturday, March 30 – BIG GAME SATURDAY! – NE Football Specialty jersey to benefit the March of Dimes with a special appearance by the NE Patriots Street Team and the Lombardi Trophy! In addition, Pat the Patriot will be on hand with a former Patriots player (TBA). Every Saturday night home game is SATURDAY NIGHT SIGNINGS presented by MidState Auto Group with a Railers player signing autographs during the first intermission. Puck drop is at 7pm vs. the Brampton Beast! Sunday, March 31 – KIDS GIVEAWAY SUNDAY – 1st 3000 fans will receive a Railers HC team photo presented by Jimmy John’s. Stick around after the game for a postgame full team autograph session. Score a SUNDAY FUNDAY ticket pack which includes 4 ticket and 4 beers or 4 tickets and 4 sodas/popcorns starting at just $60! Puck drops at 3pm vs. the Brampton Beast! Wednesday, April 3 – HUMP DAY! – Score $5 off any ticket at the Box Office with your Price Chopper Market 32 AdvantEdge Card. Saturday, April 6 – BIG GAME SATURDAY! – Fan Appreciation Night presented by MGM Springfield with a Boston Bruins Alumni Doubleheader to benefit Why Me? Every Saturday night home game is SATURDAY NIGHT SIGNINGS presented by MidState Auto Group with a Railers player signing autographs during the first intermission. There will be a ton of giveaway and prizes throughout the game! Individual tickets start as low as $15 by calling 508-365-1750 or visit RailersHC.com. Save $$$ with a RAILERS 6 PACK which includes six flex tickets and a Railers winter hat starting at $99. https://railershc.com/wp-content/uploads/2019/03/WILLICKDYLAN-76874-031619-Rich-LeBlanc.jpg 648 1152 admin /_media/logo082018.png admin2019-03-18 13:07:502019-03-18 13:10:04THE PLAYOFF PUSH IS ON!